Millard Sheets was born on June 24, 1907 in Pomona, California and was educated at the Chouinard School of Art in Los Angeles, California. 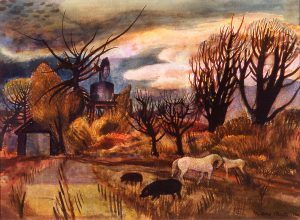 He went on to teach watercolor painting at the Chouinard School from 1927 to 1929, then served as Director of the Art Department at Scripps College in Clairmont, California from 1932 to 1955. Sheets later became Director of the Los Angeles County Art Institute and began to travel as much as he could between lectures to places such as Moscow, Armenia, Mexico, Tahiti, and West Africa. From 1966 on he hosted many workshops in numurous foreign countries like Greece, Japan, and Egypt to name a few. Sheets died March 31, 1989. Sheets is internationally recognized as one of the top watercolorists of his era; his work is known for its intensity and clarity of tone. His paintings were labeled as “abstract representations” and Sheets had this to say about that, “Abstact design is fundamental to the representational painter. There shouldn’t be a quarrel between abstraction and representation. Abstaction has given the mind back to the artist.” His work can be found in many permanent collections including those at the Art Institute of Chicago, Metropolitan Museum of Art in New York, and the National Gallery of Art in Washington, D.C.